I look at all the hoopla surrounding the final episode of ER, ending a run of 15 years and 331 episodes, and I can't help thinking of GUNSMOKE. The legendary CBS western ran for 20 years and 600+ episodes…far more than ER. And unlike ER, most of the principal stars of GUNSMOKE remained to the bitter end… bitter, not because the show was doing poorly creatively or in terms of audience numbers, but because it was cancelled without a final episode, without so much as a thank you to the cast and crew that had labored over the show from 1955-1975. Everyone on GUNSMOKE thought they'd be coming back for another season. They found out they weren't by reading the bad news in the trades. That would be unthinkable today. Respect would be paid, if not with a final episode, then certainly with the tributes and retrospectives we've seen lavished on shows like BOSTON LEGAL, HILL STREET BLUES, CHEERS, MASH, SEINFELD, BATTLESTAR GALACTICA and so many, many others…none of which has matched GUNSMOKE's longevity. GUNSMOKE still remains the longest running, scripted drama in U.S. television history. LAW & ORDER is fast approaching the record, but unlike GUNSMOKE, it has experienced a lot of cast-turnover. There's nobody left on L&O who was there in episode one. The same is true of ER. The ER we were captivated by 15 years ago is not the same show that will be ending this Thursday…that cast, and that show, is long gone. 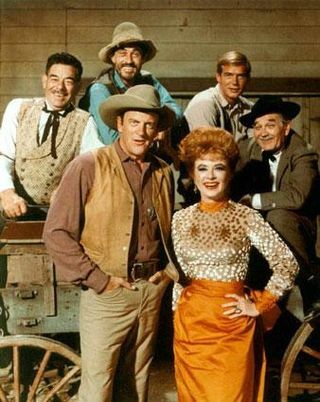 But James Arness as Marshal Matt Dillon and Milburn Stone, as Doc, were there from start to finish (Amanda Blake as Kitty stuck with the show for 19 years). They deserved a better send off. I am so bored now by TERMINATOR: THE SARAH CONNOR CHRONICLES that all I really notice are all the things they are doing to cut corners on the budget…which mostly involves lots of shooting on the standing sets and the Warner Brothers backlot. But they also use some other common TV tricks. In last weeks episode, for example, Sarah and John go to visit a friend who is staying at a house/lighthouse near the ocean. You assumed it was near the water because of the lighthouse and a boat on a trailer parked out front. I could be wrong, but what I think what I saw was a typical TV illusion, one I have used many times myself. On DIAGNOSIS MURDER, we did an episode set in a small, seaside village. But we never got anywhere near the water, either. We used stock-footage establishing shots of Mendocino, California, a village on the cliffs above the raging surf, but we shot the episode entirely Moorpark, a farming community at least thirty miles inland from the ocean. We simply dressed the shops with surfing, beach, and fishing props and put lots of people on the street in beachwear…and in post-production, we added the sound of seagulls and crashing surf. We actually got letters from people asking where the town was so they could visit it. On the first season of BAYWATCH, we shot footage of the Venice beach promenade and then dressed the commissary and garage of the Columbia Studios lot to look like part of it. We shot tight, filled the screen with people in bathing suits, and added the right sound effects. We did it more for convenience than to save money… afterall, we'd dumped a fortune into recreating the entire Santa Monica Lifeguard Headquarters, interior and exterior, on a massive soundstage (as well as an entire house, inside and out, but that's another story). Having a fake stretch of the promenade on our "backlot" saved us the trouble of a location shoot to Venice beach and allowed us some flexibility to complete a day "on stage" even if some exteriors were involved in day's shooting schedule. My friend David Carren, with whom I worked on DIAGNOSIS MURDER and MARTIAL LAW, has written & directed a low-budget student film called THE RED QUEEN that features another good friend of mine, author/actress Harley Jane Kozak, who blogs today about her experience making the movie. 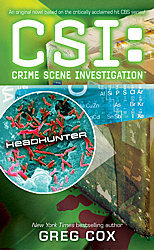 James Reasoner (the Civil War Battle series) is the first to take the shared Hunt pen name and launch an adventure series that raises the action bar to nosebleed heights. After a mysterious beauty delivers a bloodstained Confederate flag and a whiskey bottle full of water to the Hunt brothers at a fund-raising reception, millionaire adventurer Gabriel Hunt and beautiful, gun-toting museum director Dr. Cierra Almanzar follow clues and an ambiguous map from Manhattan to Guatemala, only certain they're on the right path when somebody's shooting at them. Hunt, armed only with his fists, bullwhips, a Colt .45 double-action Peacemaker and a vintage Civil War muzzle loader, is often outnumbered but never outwitted. Pulp adventure fans will be thrilled to see the genre so smashingly resurrected. Congratulations James! It's great to see him getting the recognition he so richly deserves. It seems like everything in life causes cancer. Now its hot tea. Tomorrow it's reading blogs. I recently attended a Writers Guild seminar on international opportunties for writers. The basic message was that writers need to start thinking globally if they want to survive in this business. I have been thinking globally for a while now…especially after spending much of 2007 working abroad (writing and producing the action movie FAST TRACK, among other things). It also helps that I've been married to a French woman for nineteen years…France feels like my second home and I am pretty comfortable in Europe. So with the global marketplace in mind, I have been looking around for an agent to represent me across the Atlantic. I am pleased to say that after a long search that I've just signed with Peter MacFarlane at MacFarlane Chard in London, one of the best agencies for actors, directors, producers and writers in the UK. I'm very excited about this new relationship and the great opportunties that this could lead to for me overseas. Meanwhile, I will continue to be represented for film & TV in the U.S. by Mitchel Stein and in publishing worldwide by Gina Maccoby. est honor the IAMTW can bestow is the Grandmaster Award, which recognizes a writer for his or her extensive and exceptional work in the tie-in field. This year's honoree is KEITH R.A. DeCANDIDO. He has written over thirty novels, most of them original tie-ins or novelizations. His work includes many Star Trek novels, as well as original books in the CSI: NY and Supernatural tie-in series, to name just a few. Congratulations to all the nominees and special thanks to all of our judges for their hard work.